Y aurait -il une âme de bonne volonté qui pourrait mettre ce document en forme? 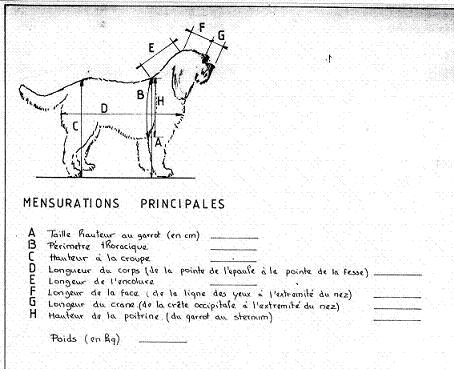 Il faudrait pouvoir ajouter un espace pour le nom du chien qui est mesuré/toisé et moderniser le document sans changer le dessin du chien, svp? Is there a kind sould who could layout this document so as to cover a full page and with at the top the same drawing of the Barbet. Then adding a line for the dog being measured and the rest of the info under. your contribution would be greatly appreciated. it's urgent, as usual! I am looking for a list of Barbet judges across the world. Please help. I would need a list of Canadian judges, please? Hotels in Chatel Guyon. Famous SPA town. Not far from Clermond Ferrand. I think what the Barbet has been accused of would never happen in another breed. How did it happen in France and with French people slandering their own treasure to this day? I may never understand. I'm shaking my head and it's not Parkinsons(sp) disease. Do you think they were standing at the door of the Kennel Club when it went live begging to register dogs? Please send me as many of these as possible, I think we found a most interesting subject matter, eh? I am not sure I can handle 2 pieces of good news in one day..
My Fanny Forigoler, is 4/6 on the SCC selection grid, which means IF she has pups and there are 3 who have a 3/6 quotation, she would be 6 /6 so better than her mom, Coccolina at 5/6. I say, wow. Then, in the same day, I found out that Domingo P de la serve de la Chapelle d'Alexandre had mated a Swiss female...I say "double wow". Bravo, my Barbets...make them babies..! Positive news site! Much nicer than the everyday morale zappers!